With a heritage going back to the Suzuki LJ10 of 1970, the Suzuki Jimny is a popular small 4x4 that is, amazingly, only up to its third generation after 45 years. Well known for its value, not to mention its ability, agility and willingness to provide a fun driving experience for responsible drivers on the beach and in the bush, the Jimny keeps up to date with technical advances rather than the occasional pretty taillight redesign. 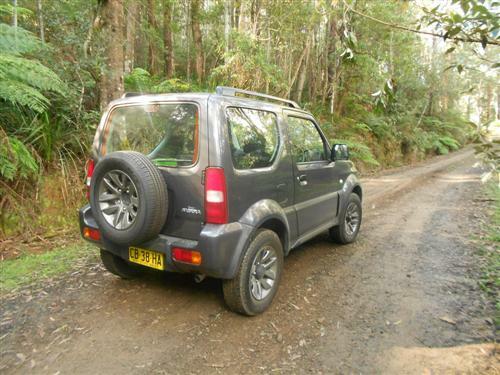 Our Quasar Grey test car was an automatic transmission version of the little four-wheel drive Suzuki Jimny Sierra. There is just one version the Jimny these days - it's a 2-door 4-seater hardtop with a small boot all delivered in a neat package with a tiny 'footprint'. Drive-away pricing is currently from $19,990** for the Jimny with manual transmission and from $21,990** for the automatic transmission version. Premium/metallic paint is optional at $475*. 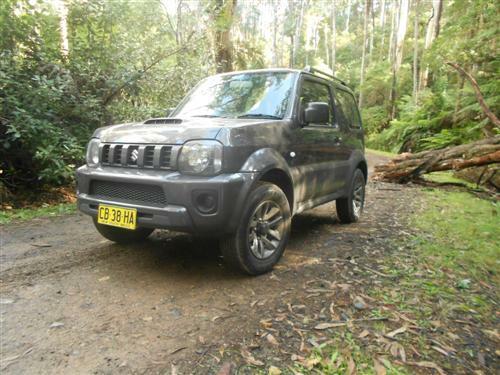 Firstly, you need to understand the Jimny's position in the marketplace. As a price conscious small 4x4 you will no doubt understand some compromises are necessary to make this the package that it has become over the years. So a small engine is part of the deal. Now that in itself isn't a problem, especially in the urban jungle. However, at highway speeds it is noticeable that it is a small engine sitting in front of you. The steering is a bit slow, which is fine when you're off-road but you may require a 'get used to it' break-in period if you're used to a more direct steering effect. Almost all of our driving was in suburban Melbourne although we did manage one trip to western Gippsland were we managed lunch at the Erica Post Office (in what has become our tradition) and good exposure on well maintained unsealed tracks and even a river crossing. 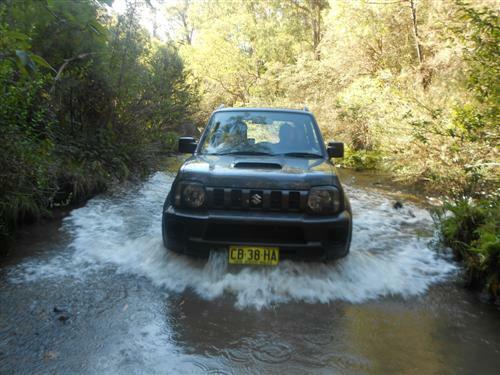 It was in this easily managed bush environment, including the river, that the team enjoyed the Jimny Sierra most of all. The little Suzuki is a treat in this environment. Even after five or six hours in the saddle - with a break during the bush and river experience - I felt that the seating was adequate although it is basic - just as you would expect in the Jimny's price range. In suburbia, the Jimny's agility is appreciated. It fits into the tightest of parking spaces. The ride height is also an attribute that many people desire. The Jimny price suggests you don't get a fully equipped top-of-the-line car. But neither is it skinny. The Jimny Sierra has air conditioning, power steering, power windows, clock, day/night rear view mirror, easy-slide front passenger seat to enhance back seat entry/egress, door pockets (quite narrow though), split rear seat backrest and, of course, cup holders. There is no cruise control though and the steering wheel adjustment is up and down only (no telescopic function). 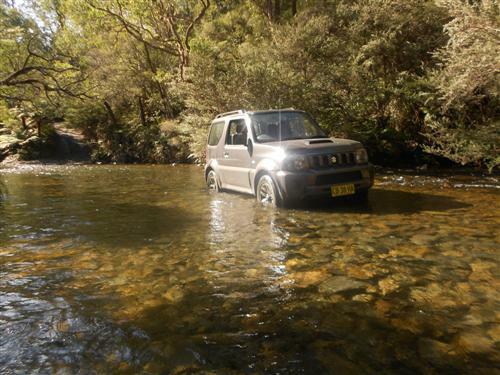 Connectivity isn't a plus for the Jimny. In fact, the third generation Jimny was designed before many people even had a mobile telephone! 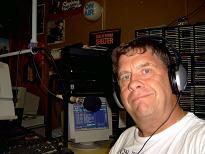 A radio and single disc CD player is standard. Look for more sophistication with Suzuki's next small 4x4. A 1,328cc four-cylinder proves 62kW of power at 6,000rpm and maximum torque of 110Nm at 4,100rpm. 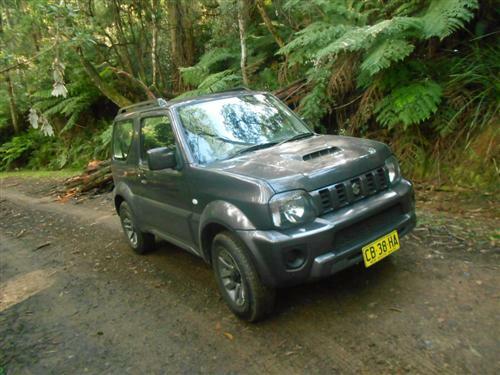 This is suitable for the little Jimny around town but it is hard pressed to keep up with a 100km/h speed limit on longer uphill stretches of highway in undulating country regions. A five-speed manual transmission is standard, but the test car was fitted with the optional automatic transmission. Being a real 4x4, a transfer case is fitted to both the automatic and manual. It's a simple to use push button type. Car needs to be stationery to move to and from low range. Coil springs are used with the suspension system, both up the front and at the rear. Brakes are discs up front and drums at the rear. Five attractive fifteen-inch alloy wheels are standard. The fuel consumption rating for Jimny Sierra is 7.4 litres per 100 kilometres on the combined cycle. The fuel tank capacity is just 40 litres. Standard: electronic stability control (ESC); anti-lock braking system (ABS); dual front airbags. Ramp break-over angle: 31 degrees. As always, my advice is to respect the environment and to take the necessary precautions when driving in the bush and, even more so, when driving in water. A good idea is to have a Plan "B" when you're out in the bush. For example, for our delightful experience with the Suzuki Jimny we had five people (three experienced 4-wheel drivers) in two vehicles, plenty of fuel and adequate recovery equipment just to cover us our for two hours in the bush. 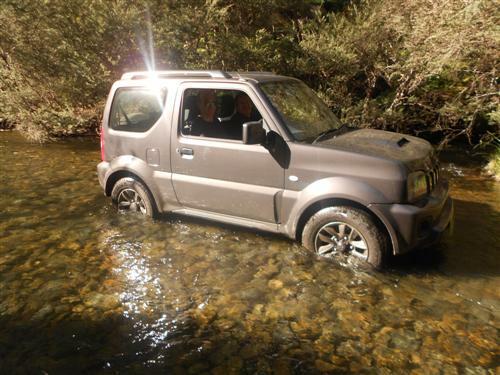 Jimny comes with a 3 year/100,000 kilometre warranty (conditions apply). The warranty can be extended up to 5 years/140,000 kilometres if the eligible car is serviced in accordance with the manufacturer's recommendations by a Suzuki dealer under the capped price service scheme (conditions apply of course). 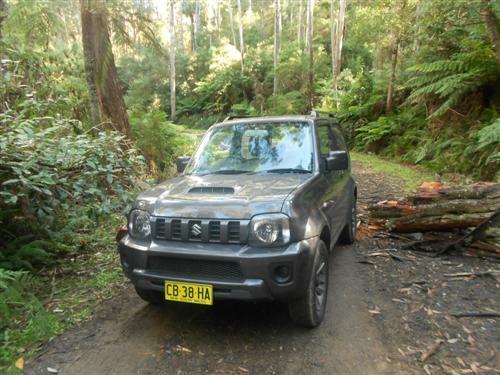 The Suzuki Jimny Sierra is like an old friend - the more you know such a friend the more you respect such a friend. And we were pleased to have the Jimny Sierra for 1,056 kms. Whilst short on sophistication, the Jimny is big on pleasure and fun. And it represents tremendous value. If you have a Jimny Sierra you don't just commute to and from work - you enjoy it away from the tarmac where it is at home! Suzuki have made plenty of people happy with little 4x4s over the past 40 years in Australia. The next forty years are 'gunna' be good too ..... I can just tell! NOTE: * Manufacturer's List Price (MLP) excludes dealer delivery fees and the numerous statutory charges (commonly known as on-road costs). ** Drive-away prices include on-road costs based on certain criteria (such as driver circumstances, location and supplying dealer charges). Price should be confirmed with a Suzuki dealer.